Catherine Crone – a self-confessed fair-weather cyclist – is the former MD of Headwater, which specialises in luxury cycling and walking tours. 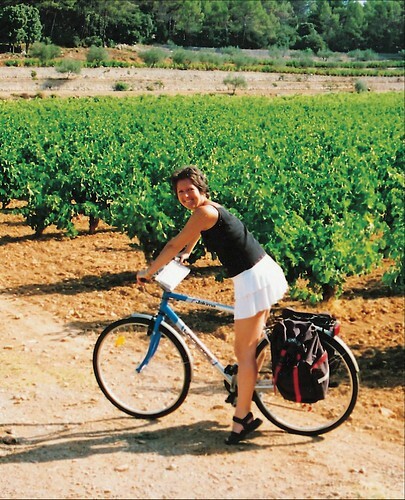 She chats about her love of France and (non-hilly) cycling. Cattherine Crone on an early cycling holiday in France. Can you tell us about your first time cycling in France? It was a very gentle six-night gastronomic cycling holiday in the Loire Valley. We chose it because it was graded as 1-bike ("easy"!) so we thought, as novices, we'd best start with something gentle. Plus it was only six nights so, if we really didn't take to it, it wasn't too long! The added appeal of gastronomic meals in a region renowned for its fabulous wines was undoubtedly an added bonus. We stayed in fabulous hotels, gorged ourselves silly, and, above all, just really appreciated the freedom of cycling at our own pace, stopping off when we liked, with nothing to worry about other than getting to next hotel in time for dinner. We visited masses of world-famous chateaux, went wine tasting in tiny unknown vineyards, and finished the trip with and extra two nights in the cosmopolitan university town of Tours. In all, it suited us down to the ground - we were hooked! Why did you originally choose to cycle in France? Having studied French at university, followed by a summer working on the Atlantic Coast, France became a home-from-home for me at quite an early stage in my adult life. It excels in all the things I love – food, wine, people-watching, fashion, life outdoors – and doesn't really score in the things that don't interest me – TV, film, music, to name a few. Before I joined Headwater 20 years ago, I'd never have considered a cycling holiday of any type – I'd had a bike to do a paper-round as a teenager, but that was about it. However, the idea of gently pedalling from hotel to hotel, enjoying long leisurely al fresco lunches en route, while somebody else moved my luggage, well, it held a certain appeal. After our first year, I think we've done a trip every year since – usually France, but also in Spain and Italy. What’s your most vivid memory from that first trip? By day: stumbling across the fabulous House of Magic (in French) in Blois; by night: discovering superb value Touraine red wines over dinner. Enjoying the sun in the south of France. France will always have a hold over me (despite the fact that a couple of years ago at £1:€1, it was an expensive luxury!) as it offers so much of what I enjoy and is so close to home. For our main holiday, we usually drive – taking the Eurotunnel – as driving in France is so much more relaxing than driving in the UK. Yes, tolls are pricey, but they certainly keep the motorway traffic down, and you hardly ever get the sort of queues we've become accustomed to in the UK. Once in situ, I love people-watching from café terraces, wandering round the local markets, buying bread on a daily basis (if I was truly French, I'd buy twice a day! ), enjoying the plat du jour at lunch – the list goes on. We probably visit France at least six or seven times a year – at other times, we'll pop over on a flight after work for a quick break or a long weekend – dead easy unless the French are on strike, which can be quite often. You have a house in Vence in Provence, not far from Nice. What drew you there? We've owned a home in France for many years now but were previously in the Aveyron region. It's absolutely lovely there – very unspoilt with warm, friendly people, fabulous food and great value wines. But it was difficult to get to from the north of England and, secondly, as the youngest people in the village by 30 or so years, we just felt it was too remote and quiet for us. So, in 2004, we sold up and with lots of tears, we closed the doors for the last time. Over the next 18 months we considered a number of places, including the south of Spain and Dubai, but our hearts kept coming back to France. We made a check-list of everything we felt was essential, nice to have and not important to ensure for our next home. We'd not really got much further than that when one weekend in 2006 I happened to read an article called "My Heaven on Earth" in one of the national papers in which the author was talking about Vence. I cut it out, gave it to my husband Phil, and said "that's where I want to buy!” The rest is history and we wouldn't change a thing. We do rent it out over the summer, but we also very much treat it as our home and will definitely spend more time out there in the long term. How’s the cycling in that part of the world? A bit too hilly back in the mountains where we are. Fortunately we have a bike rack for the car so we just load the bikes on and drive down to the coast, just 20 minutes away, where it's pancake-flat and often marked with traffic-free cycling trails. To be able to cycle in gorgeous sunshine around the coast from Nice to the Cap d'Antibes, then have lunch on the beach watching the super yachts cruise in and out really has to be one of the best ways to spend a day. If you could ride your bike anywhere else in France, where would you go? A couple of years ago we cycled around Brittany's Emerald Coast and I've never been more surprised: it was simply stunning. We cycled for eight days and saw virtually no other tourists on our travels nor hardly any cars. The beaches were like something from the Caribbean and the people so wonderfully friendly and eager to please. Towns like Dinan and Dinard were a joy to explore, with masses of character and history. We just loved it. I'd therefore definitely like to see more of Brittany – it's a big region and we only got to know a small corner. Most under-rated place in France for cycling? Given my own experience, I'd have to say Brittany. 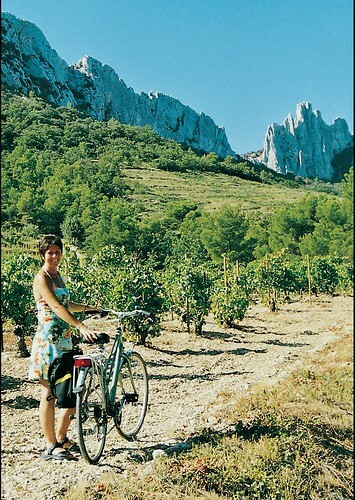 Do you have any words of wisdom for people planning their first cycling holiday in France? Choose somewhere relatively flat if you've not been on a bike for a few years – this is particularly important if you're travelling in high season when it might be hot. Be prepared to start off early if it is set to be a scorcher – cycling in 30-degree heat is not many people's idea of fun, so try and get most of the hard work done by lunchtime if you can. It's worth noting that most people cycle an average of 9 miles an hour (based on a mix of flat/slightly hilly terrain), so if you factor this into your planning, you've a good chance of working out a route to suit you. And don’t forget that it's a holiday, not an endurance test, so make sure you leave plenty of time to get off your bike and explore local towns, go wine-tasting, enjoy leisurely lunches, or laze by the pool – whatever it is that you normally enjoy most on holiday. See Catherine's Top 10 Loire Chateaux to see by bike.